Leo and I are on "vacation," in Maine with my parents. We're surrounded by relaxing options—walking, blueberry picking, swimming. Heck, I'd settle for napping or reading. But Leo, well, he just won't settle. A nap? That requires carrying him around for hours in the front carrier without sitting down. Reading? Well he might stand for half of Panda Bear, Panda Bear, What Do You See? I'm writing this as fast as I can while my mom dangles a stuffed turtle over Leo with one hand and attempts to eat breakfast with the other. Three adults, two of whom have experience in the baby department, and we're outnumbered. Don't get me wrong, I love it up here. The mountains are gorgeous, the air smells sweet, and we're having delicious, summery meals. Plus, it's very nice to be mothered when you're a mother, and my mom obliges with blueberry pie, cups of tea delivered to me while I'm nursing, and bowls of cherries that appear on the coffee table while you're looking the other way. Leo, however, isn't so into being away. I think he joins me in missing his Daddy terribly. Plus, without his swing, his baby gym, the mobile over his changing table, and most of all, our daily routines, Leo is at sea. Even the bath is strange and large here, and instead of showering us with smiles as he luxuriates in the warm water he just looks up beseechingly, as if to say "please don't let me slip into the drink!". I miss our routines too. Most of all, I miss the mom and baby friends I've made since Leo was born. Being away makes me really appreciate how important it is to have friends in the same boat. What would I do without someone who lives nearby and is willing to head out for a walk with the strollers anytime, or spend an afternoon at a cafe sipping iced coffee and breastfeeding? Where would I be without someone to meet up with at mom and baby pilates (who will later agree that it's absurd to spend the morning lying on the ground with a bunch of other full-grown women singing twinkle, twinkle while doing leg lifts)? Those exercise classes are so important to me, though I probably get more of a workout carrying the baby to and from them. The women I met in prenatal yoga are all there with their babies, and we've formed a baby group that meets in the park the day that there's no class. We talk about breastfeeding, older siblings, sleep, weight loss, and, most of all, what carriers we're using to tote our babies around. Babywearing has become an obsession. 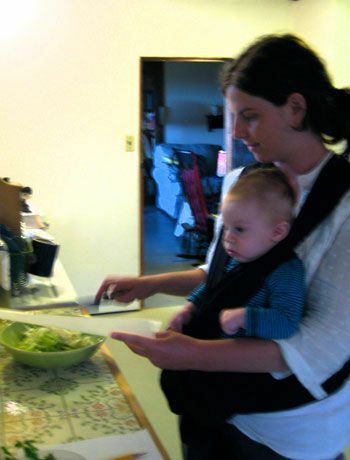 I've got the Bjorn, the Ergo, a padded ring sling, and my new favorite, the Moby wrap. My friend Lauren, in addition to the Bjorn and Ergo, has a Maya sling and a gorgeous Mai Tie, and she just invested in a Didymos wrap. All these pricey pieces of fabric and straps mean the world to us right now. They mean we can walk around the city, hop up into busses, trot down the subway steps, maneuver narrow shop aisles, and, at home, cook a little, clean a little, get a little typing in, all while staying in touch with our babies. I brought the Moby and the Ergo to Maine, so you'd think we'd be all set. But up here, there are bugs and rain, and no busses, trains, or shops. We're out of our element. We do take some gorgeous walks every day, we spend time rocking in the rocking chair, and I try to get in a little cooking, but without other moms and babies to plan activities with, I find it hard to fill the day with things that make me and Leo happy. Learning how to handle ourselves somewhere else is an important challenge. I don't want to be tied to home, and I want Leo to learn how fun it is to be in new places with different people. And in the end, missing the things we do at home, missing our everyday companions, and missing home, is one of the most lasting benefits of a vacation. It's good to get away. And I can't wait to get back.